WATCH out Mayo, an Irish Blond has been unleashed on the county. Originating from Crossmolina she is described as being like most ‘Irish blonds’ – at heart, she’s a red head. 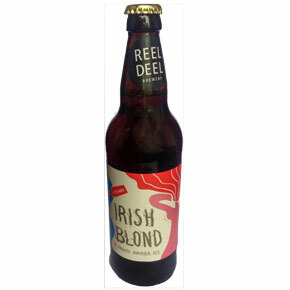 This Irish Blond is in fact, a craft beer, brewed in Crossmolina by Reel Deel brewery owner Marcus Robinson. The amber ale, ‘Irish Blond’ is the brewery’s first bottled beer and speaking to The Mayo News about the venture, Marcus said it has taken almost four years to get to this point. Originally from the UK, Marcus and wife Catherine and family, moved to Crossmolina in 2007. Catherine’s family are originally from Rathglass West and Sculibeen, the couple married in Ardagh in 1995. Following the slump in the construction industry in 2009, Marcus toyed with the idea of following his long-time hobby of brewing. Studying in the 1980s in Leeds, Marcus was a dab hand at home-brewing. However, these days the simple technique of ‘goo in a can’ mixed with water, has been replaced with a state-of-the-art brewery boasting a 16 hectolitre production capacity, with full brewing and bottling facilities in house. The brewery’s name comes from the fact that the town sits on the River Deel near the northern shore of Lough Conn. The fruity amber ale, best suited to spicy food or enjoyed on a summer’s day is the first in what Marcus hopes to be a growing range of craft beers. “If you looked at Ballina in the last six months, before you wouldn’t see a craft beer available. Now bars are stocking a bottle of this and that. The main markets are Cork and Dublin, but hopefully people will want to buy a local beer,” said Mr Robinson, who said he sold almost 40 cases of beer in the week since the beer was launched. The brewer hopes to work on a pale ale and possibly a stout before the Christmas season. The Irish Blond took Marcus three months to perfect, but he maintains that standards are everything when it comes to craft beers.